The truth is, when you banish the gods from the world, they eventually come back--with a vengeance. In the near future, Justin March lives in exile from the Republic of United North America. After failing in his job as an investigator of religious groups and supernatural claims, Justin is surprised when he is sent back with a peculiar assignment--to solve a string of ritualistic murders steeped in seemingly unexplainable phenomena. Justin's return comes with an even bigger shock: His new partner and bodyguard, Mae Koskinen, is a prætorian, one of the Republic's technologically enhanced supersoldiers. Mae's inexplicable beauty and aristocratic upbringing attract Justin's curiosity and desire, but her true nature holds more danger than anyone realizes. As their investigation unfolds, Justin and Mae find themselves in the crosshairs of mysterious enemies. Powers greater than they can imagine have started to assemble in the shadows, preparing to reclaim a world that has renounced religion and where humans are merely gamepieces on their board. 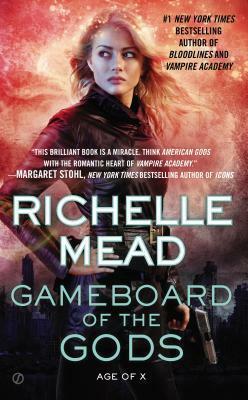 GAMEBOARD OF THE GODS is the first instalment of Richelle Mead's Age of X series: In a futuristic world nearly destroyed by religious extremists, Justin March lives in exile. But Justin is given a second chance when Mae Koskinen comes to bring him back to the Republic of United North America:. "This brilliant book is a miracle. Think American Gods with the romantic heart of Vampire Academy. What's the point of world-building if you aren't building something and someone to love? I'm in love with every character in this book. How do I know? When I got to the last page I turned to the first and started again, thinking this is why I read." -Margaret Stohl, New York Times bestselling author Icons "Vivid world-building, whip-fast pacing, and a layered plot combine to make Gameboard of the Gods a riveting read!"